Why Do People Like Wearing Rajputi Poshaks These Days? 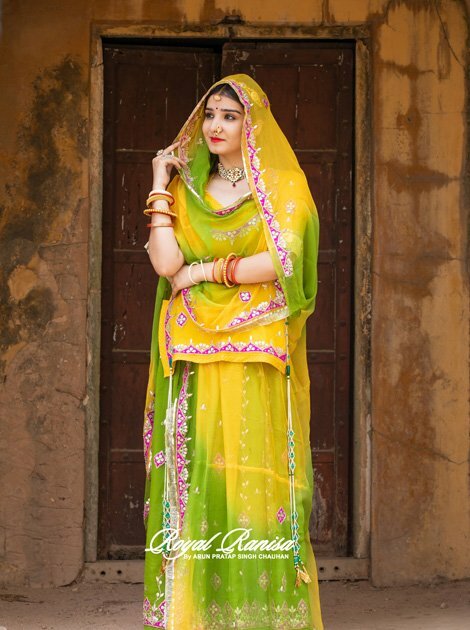 Rajasthan is enriched with many architectural wonders, cultures, festivals, customs, rituals, foods and of course not to forget the wide variety of clothes. Like the saying goes, that in Rajasthan the linguistic style changes after every 30-40 km, so is the same with the attire. In earlier days, a person’s caste or religion could be defined by the clothes worn. But this is not the case anymore. People do not wear clothes according to their castes, but according to their taste and Rajputi Poshaks is one of them. This is one of the main reason that more and more people are getting attracted towards the Rajputi attire. The Elegant and ethnic look of the Rajputi Poshak, makes you stand out in the crowd. Come to think of it, who would not like to be dressed like a queen (Ranisa) and feel Royal. Yes! This is exactly how a Rajputi Dress makes you feel. Imagine yourself draped beautifully in a Chiffon Lehnga with Zardozi work on it accompanied with a simply beautiful and elegant Odhni. Just the thought of it is making me want to get all dressed up in a Rajputi Poshak. Don’t you have the same feeling? Royal Ranisa, is a place that will fulfill all your desires and satisfy all your irks regarding Rajputi dresses. We have so many varieties that they are the perfect selection for any function, be it a small home ceremony or a grand wedding. Offering a wide range of multicolored Poshaks, exclusive red bridal Poshaks, other bridal Poshaks and daily wear Rajputi dresses, we are a specialized outlet only for Rajputi dresses in Jaipur. All these dresses available at an exceptionally reasonable price, which is another reason that makes us different from other Rajputi Poshak outlets in Jaipur. With so much of variety to choose from and that too at prices to suit your pocket, who would not like to feel like a Rani dressed in attire purchased from Royal Ranisa. The wedding is one of the most auspicious and memorable occasions for a girl and so it should be perfect in every manner. When it comes to the bridal dress, without giving a second thought you should visit the Royal Ranisa and choose from a wide range of Poshaks available in Jaipur. Rajputi Poshaks are being adopted widely by everyone not just in Rajasthan or India, but even beyond. 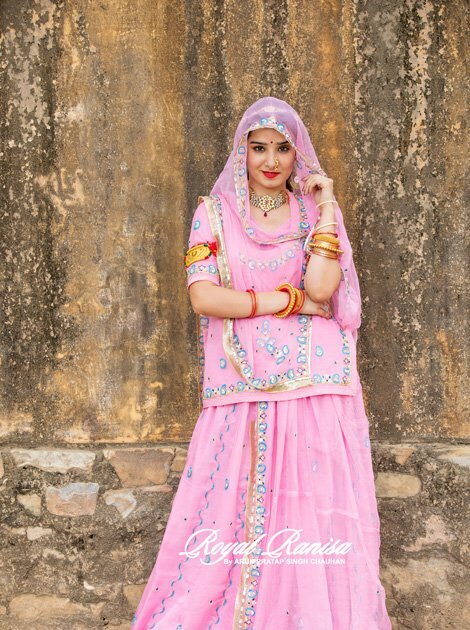 Whether a Rajput or not, every second woman is switching their dressing styles to Rajputi dress. Therefore, this is for all those of you who are looking for the right place to Buy Rajputi Poshaks in Jaipur, Royal Ranisa is the destination. Do not miss your chance to get the best Poshaks in Jaipur and feel royal, visit the store at the earliest. Royal Ranisa is the Best right place to buy Rajputi Poshaks in Jaipur. The Elegant and ethnic look of the Rajputi Poshak, makes you stand out in the crowd.